Courtney is SO amazing! I met her at a wedding I photographed and she is absolutely radiant. As a planner, she is organized, calm, kind and professional. She fits in naturally and manages to make an otherwise stressful day seem effortless. As a designer, she is unique and talented. Her aesthetic is enchanting and I wouldn't hesitate to hire her for wedding. :) She's a keeper." "I would highly recommend Courtney for any role relating to event planning. She was the day of coordinator for my daughter's wedding last weekend. I had been unsure of whether we really needed someone in this position. OMG. I can't believe I even considered not having a day of coordinator and I'm so thankful that my daughter chose Courtney after interviewing several. 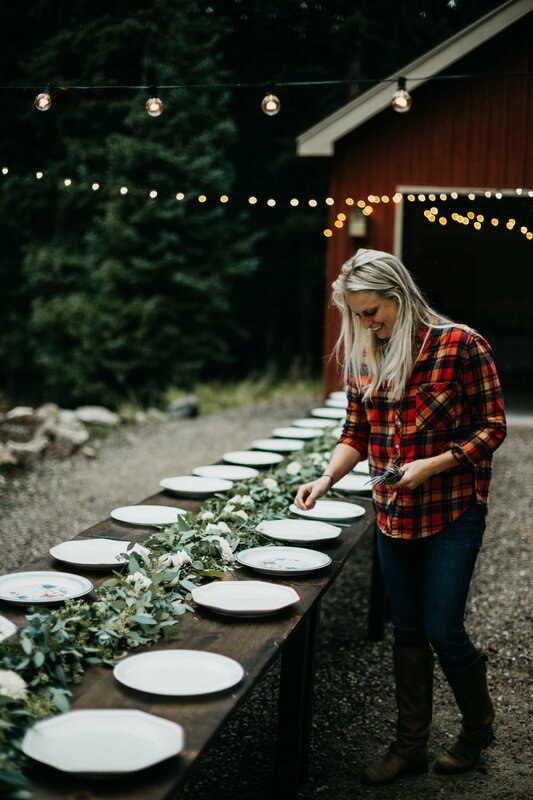 Courtney helped Frances finish up and pull together last minute crafts and she hauled all of it to the venue, then worked with the florist to decorate just like Frances had envisioned. She ran the rehearsal, and the events/timeline on the day of the wedding, as well as cleanup. Everything went so smoothly and the mother of the groom and myself were able to enjoy the ceremony and reception because we were not having to run the show. Courtney's enthusiasm and positive attitude, creative eye and organization made her invaluable and a pleasure to work with." "Our wedding happened because of Courtney and her team. I found this babe through HER wedding photos a couple years back, and said ok, this girl has amazing style, and I want to be her friend because she looks like the most fun. Turns out those photos were spot on at capturing who she is, because when I finally DID meet her and she told me she was in the day of business, I made a mental note and filed it away till I started planning my own wedding. Not only is Courtney just a ray of sunshine, she knows what she's doing. We met with her and she asked questions I hadn't even thought of before. We had some hiccups with the beverage company changing last minute, and she was on it (even though that wasn't even her responsibility!) she put me at ease the whole month leading up to our wedding which I would say is worth more than gold. That last month is wild. Courtney was our port in the storm. She and her team flipped the entire room over from ceremony to reception with smiles (amazing) and even cleaned up after our guests. The morning of Id looped her into a text with everyone who was coming to the hotel and my mom asked what the address was, and before I even saw the text, Courtney had responded to her. I was astounded at how helpful she was in ways I could not have even guessed I needed her for. If there is one thing you do for your wedding, it's hire a day of coordinator. If you want to do that the best way you can, hire Courtney." "Courtney and her team did an incredible job Day-of-coordinating for my wedding. When I was looking for candidate I wanted someone who knew what they were doing and would be on top of things so my mother, my mother-in-law, and I didn't have to lift a finger the day of the wedding. Not only that, but I wouldn't have to worry about things being done in my taste, bc I am VERY particular. Design-wise Courtney took charge of the creative things, found someone to make wedding signage, constantly asked what else she could do, what she could pick up in advance, was extremely organized, and already had style very similar to mine- all of these qualities helped calmed my nerves for the big day. She perfectly arranged all my decorations I had spent months envisioning and more things I hadn't even thought about. She coordinated the day flawlessly, with a smile on her face, AND calmly, which is extremely important. I would highly recommend her for any event, whether it's coordinating, design, or both, she can handle it all." "I had the chance to work with Courtney this summer on a wedding up in Beaver Creek.... and it was the absolute best! She is a gem to be around and her sense of style is something that definitely stands out! Working side by side with her was as easy as it gets and every time I see her new project my jaw drops! Courtney is definitely your go to for all things design and planning!" "I can not recommend Courtney at Courtney Cyr Design enough. I used her to help coordinate photoshoots, events + installations. She even helped me with my own wedding! Courtney has an eye for design that is immediately apparent from the way she dresses to her knack for organization. If you are considering hiring a planner for your event or wedding give her a call and set your mind at ease. 10/10 would give my personal recommendation."